Due to the crowding of the EM spectrum and the plethora of communication standards, both commercial and military, the ability to adaptive receive Radio Frequency (RF) information is crucial. Using high-speed ADCs to convert directly from RF to the digital domain offers the ability to sub-sample RF signals without the cumbersome narrowband circuitry associated with traditional architectures. By using digital filtering techniques to adaptively change between standards and by varying sampling frequency to change the received band, a highly versatile receiver system can be implemented. Iterleaved ADCs architectures provide a means to achieve very high speeds, but state-of-the-art ADCs still suffer from drastically reduced ENOB above 5 GHz. 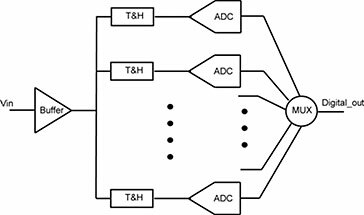 Prof. Ricketts group is investigating fundamental limitations to realizing these high-speed ADCs, in particular jitter, clock generation and distribution and limited bandwidth of T&Hs.